HomeUseless Drugs And Vaccines – Lying Science Whores. Told You So. Useless Drugs And Vaccines – Lying Science Whores. Told You So. A new study published today by a research team at Oxford University reveals that as many of us alternative media reporters said at the time, the drug Tamiflu, prescribed for hundreds of thousands of people during the swine flu ‘pandemic’ a few years ago, does nothing to halt the spread of influenza and the Government at that time wasted nearly £500 million OF OUR EFFING MONEY stockpiling it, a major study has found. Are they saying vaccines and drugs are useless? You might well ask. 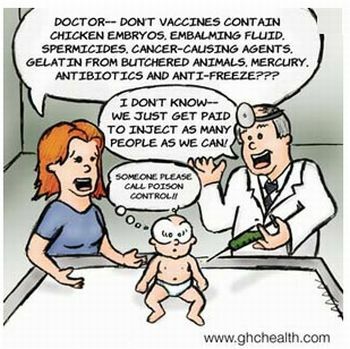 No, what they are actually saying is that the purpose of most vaccines drugs and therapies in to make us patients for life and thus turn us into cash cows and guinea pigs for the Pharmaceutical Corporations’ profit making machine. You many remember that the Swine Flu pandemic was going to kill squillions of people and would be so potent that when the clever scientists gave us their clever drugs to bring us back to life the disease would kill us again … and again. That’s exaggeration, but the miniscule threat (that turned out to be not a threat at all, there were less caess of flu in swine flu year than a normal year. Swine flu was overhyped to the extent that when the disease failed to jump the species barrier and kill squillions of people, that august body the Whores’ Health Organisation World Health Organisation was forced to redefine the word ‘pandemic’. Itstead of meaning ‘”Will infect tens of millions and kill millions on every continent, it now means “Will maked a few people here and there feel a little off colour. But the scientists and their Big Pharma paymasters, lying whores and greedy bastards that they are, would not hold up their hands and say “Sorry folks, we got it wrong,” thus salvaging a little credibility. Oh no, they insisted that their lapdog politicians timeley action in purchasing vast stocks of Tamiflu had averted the pandemic. Really? An interesting statistic emerged later; in Germany (population 80 million) ten per cent of the population received Tamiflu and there were 3000 deaths attributed to Swine Flu. In Britain, (population 60 million)around two per cent of people in ‘vulnerable groups’, i.e. old people, children and those with pre-existing medical conditions, received Tamiflu and 30 deaths were attributed to Swine Flu. The latest review, authored by independent medical researchers at Oxford University, claims that Roche, the drugs Swiss manufacturer, gave a false impression of its effectiveness and accuses the company of sloppy science. It has previously been reported that most of the researchers who worked on trials of Tamiflu had financial links to the manufacturers (see below). The Oxford study found that Tamiflu, which was given to 240,000 people in the UK at a rate of 1,000 a week, has been linked to suicides of children in Japan and suggested that, far from easing flu symptoms, it could actually worsen them. They also expressed support for the view that Tamiflu damages the human immine system making it more likely people who take it will develop other problems. Many reports have mentioned the damage done by vaccines to auto – immune systems. Roche claimed at the time of the 2009 swine flu outbreak that trials showed it would reduce hospital admissions and complications such as pneumonia, bronchitis or sinusitis. Based on the results, the Department of Health bought around 40 million doses of Tamiflu at a cost of £424 million and prescribed it to around 240,000 people. In 2009, 0.5 per cent of the entire NHS budget was spent on a drug that scientists knew did not work. We should perhaps consider making the fuckers take their own drugs as part of the clinical trial process. There is rather more than is immediately apparent in the recent grudging acknowledgement that the swine flu vaccine increased the risk of the serious sleeping disorder narcolepsy fourteen-fold  and that those affected (mainly children) are entitled to compensation. As many will recall, the threatened swine flu pandemic of 2009 proved something of a non-event, with only 10 per cent of the predicted number of cases and a miniscule mortality rate of 0.0005 per cent. This discrepancy between the dire warnings and what turned out to be among the mildest flu outbreaks of the past 100 years prompted an inquiry by Paul Flynn MP for the Council of Europe that criticised the waste of huge sums of public money and the provocation of unjustified fears, while presciently anticipating health risks from vaccines and medicines that have not been sufficiently tested. Simultaneously, an investigation by the British Medical Journal noted how key scientists advising the World Health Organisation on planning for an pandemic had done paid work for pharmaceutical companies that stood to gain from the guidance they were preparing. So once again Boggart Blog, Little Nicky Machiavelli and The Dauily Stirrer are vindicated. We all warned that the annual flu scare and taxpayer funded campaign to push vaccines was a scam. A battle is won but the war is never ending. The next skirmish, currently being fought mainly in Japan and the USA concerns the HPV virus and the vaccine which drug companies and liberal fascists claim must be given to pubescent boys as well as girls to prevent the little lads developing cervical cancer.